So this is why WFHO is on sale at the grocery store. I better go stock up. Yep! I stocked up too, but when I run out, I'm cool with Vega One. I don't miss the grittiness at all. I tried the berry flavor at Sprouts yesterday at the demo table. It was amazing! Thanks for the review! I'm a fellow loyal Vega user. I typically use the new Vega Sport Recovery Protein Shakes. Do you know what the difference is between the two? I also use the Shake n Go smoothie powder in my breakfast green smoothies and it is amazing! I love that it adds omegas, extra greens and probiotics! The original WFHO serving was actually intended to be two scoops per serving, so the large tub actually only officially provided 17 servings. So when Vega switched from manufacturer Sequel Naturals to My Vega, they also changed the ingredients and made the scoop larger so that you get one "serving" with a single scoop. 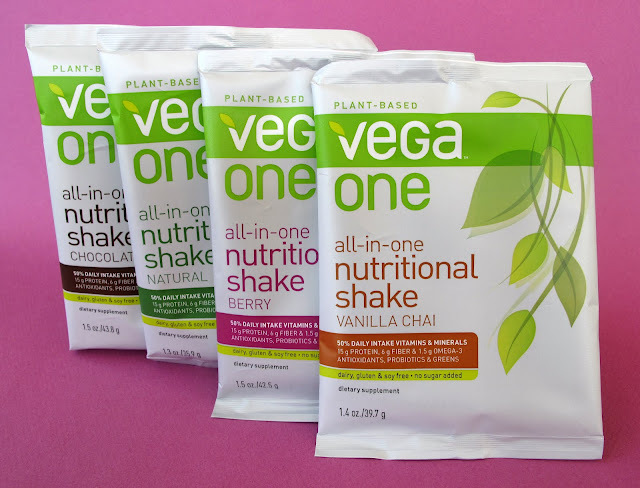 I have the natural vega one with coconut milk, spinach, and frozen pineapple and flax seed. It's awesome!